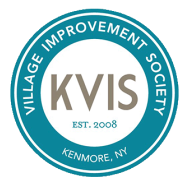 The KVIS Art in Windows initiative is a way to enhance the visual appeal and interest of the Village while helping Kenmore businesses and commercial property owners. The Art in Windows initiative has two parts of equal importance. We are working with commercial property owners with spaces available for sale or lease to place graphic art in the windows of these spaces. To help enhance the vacant spaces. We use many different types of art- from pictures made by disabled children to professional painters and sculptors. If you know of someone whose work you would like to have considered for this initiative, please have them contact the KVIS. Have you ever had a desire to make the windows of Village businesses look good for each season, to dress them and help them look festive? If so, you've got your chance now! Art in Windows initiative allows you to help business owners attract customers while enlivening the look and feel of our business district. Contact KVIS to join in the fun, anyone with imagination and flair is welcome.